The federal government is expected to rule on the project in mid-June. If it is approved, aboriginal groups say they will bury it in lawsuits. If that fails, they say they are willing to lay down their bodies to protect the earth, which they see as their children's inheritance. Just a few miles from the spot where Enbridge Inc. plans to build a massive marine terminal for its Northern Gateway oil pipeline, Gerald Amos checks crab traps and explains why no concession from the company could win his support for the project. 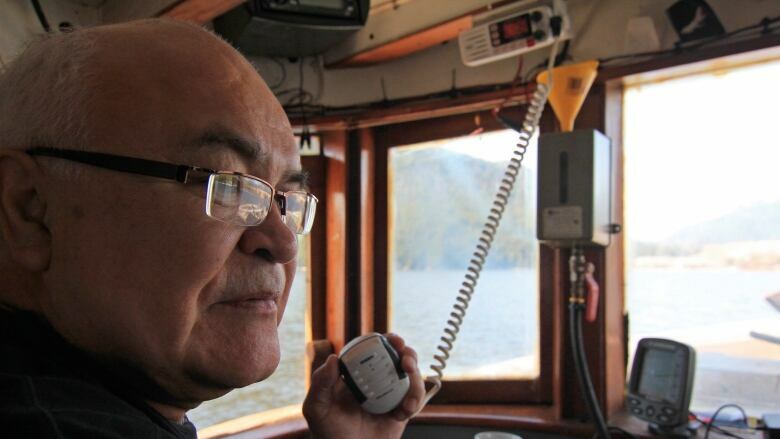 Amos, the former chief of the Haisla Nation on the northern coast of British Columbia and a community leader, has argued for years that the risk — no matter how small — of an oil spill in these waters outweighs any reward the controversial project might offer. That resolve is shared by many in the aboriginal communities along the proposed pipeline and marine shipping route who see the streams, rivers and oceans in their traditional territories as the lifeblood of their culture. MAP | Pipelines proposed in B.C. "Our connection to this place that we call home is really important," says Amos as he pulls three Dungeness crabs from his trap, tossing two in a bucket and holding the third up for his two young granddaughters, who shriek and giggle as the crustacean wriggles its legs. "If these little ones can't witness us doing what we've done for generations now, if we sever that tie to the land and the ocean, we're no longer Haisla." The Northern Gateway pipeline would carry diluted bitumen 1,177 kilometres from Alberta's oil sands to the deepwater port in Kitimat, in northwest British Columbia, where it would be loaded on supertankers and shipped to Asia. It is expected to cost $7.9 billion. Like the proposed Keystone XL pipeline to the United States, Northern Gateway is loathed by environmentalists who fear it will hasten the development of Canada's oil sands and exacerbate climate change. But it is also fiercely opposed by many aboriginals along the pipeline path and shipping routes. it will only approve projects that are safe for people and the environment. "I am committing myself to doing whatever it takes to stop this project, short of violence," Amos said. "Myself and quite a few people are prepared to stand on the line and use ourselves to stop things if they send the bulldozers in." 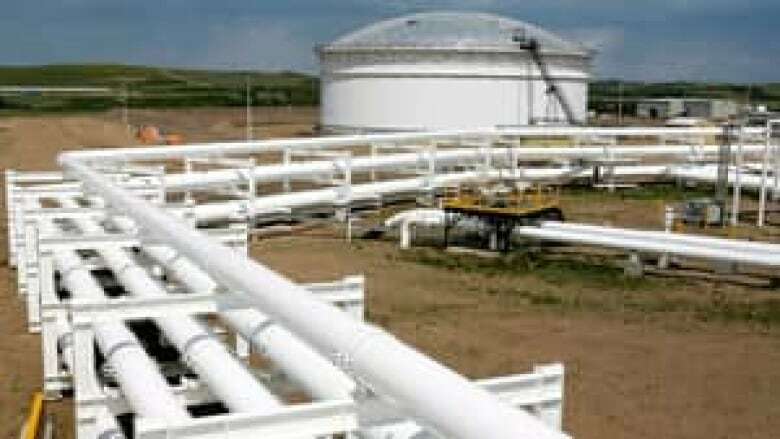 All along the pipeline route, First Nations have filed lawsuits against the Joint Review Panel's recommendation that the line be approved, citing a lack of consultation among other issues. areas. There are no treaties in much of British Columbia, so consultation claims could trap the project in court for years. "We still have control over our territory," said Peter Erickson, hereditary chief of the Nak'azdli Nation in central British Columbia. "If we ban Enbridge from coming into the territory, they will not be allowed to come in." 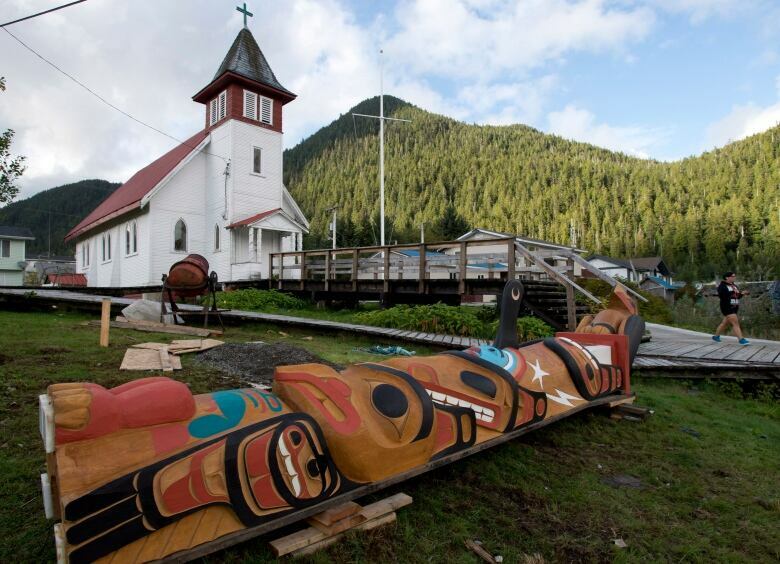 Boating culture is a way of life for the Gitga'at of Hartley Bay. This photo — taken from the Tsimshian Storm — is a portrait of Hartley Bay's shoreline. The Nak'azdli, like the Haisla, worry about the effect an oil spill would have on their waterways, particularly the Skeena River, an important salmon breeding ground. Enbridge has said it is impossible to eliminate all risks of an oil spill, but it has developed mitigation measures to sharply reduce the likelihood, along with a preparedness and response plan to limit the consequences should a spill occur. The company says the pipeline will be the safest it has ever built, with thicker-than-standard steel, deeper tunnels under waterways and more isolation valves than usual. The federal panel that reviewed Enbridge's data and the concerns expressed by First Nations and other groups determined the project should be approved if the company meets 209 technical, environmental and social conditions. Even a small risk is too much for Erickson. If necessary, he said, his people would take direct action, including blockades and sit-ins. They do not see such action as civil disobedience, but rather as being obedient to traditional laws. Saskatchewan, I can't go to Vancouver. If something happens to my home, where do I go?" Northern Gateway has some aboriginal support. 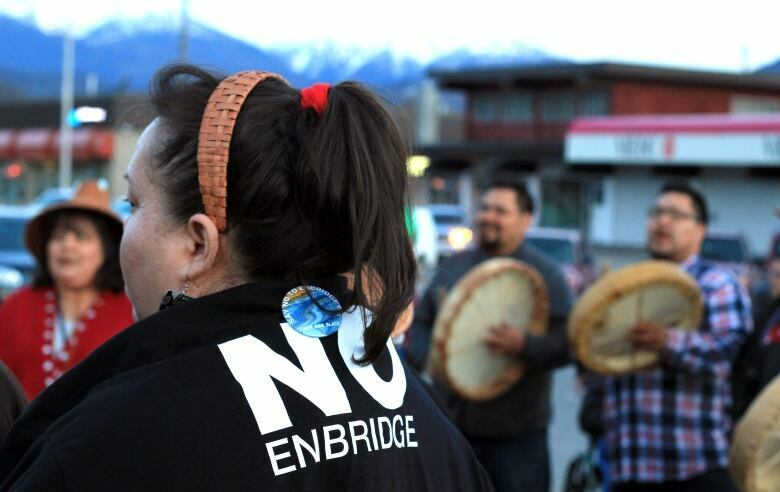 Enbridge says 26 aboriginal communities have accepted its offer of a 10 per cent equity stake in the project to be divided among the 45 communities directly affected by the pipeline. Of those, the majority were in Alberta. Just 11 of 27 eligible communities in British Columbia have signed on. Rumours that Enbridge is offering a larger stake in an effort to sway decisions have swirled among aboriginal groups, though Enbridge's head of the project, Janet Holder, downplays them. adding that the company does not negotiate in the media. Communities that have taken a stand against the project are adamant that their answer will always be "no." Sekani Tribal Council, an alliance of eight British Columbia bands, six of which are on the pipeline right-of-way. completely not up for negotiation." 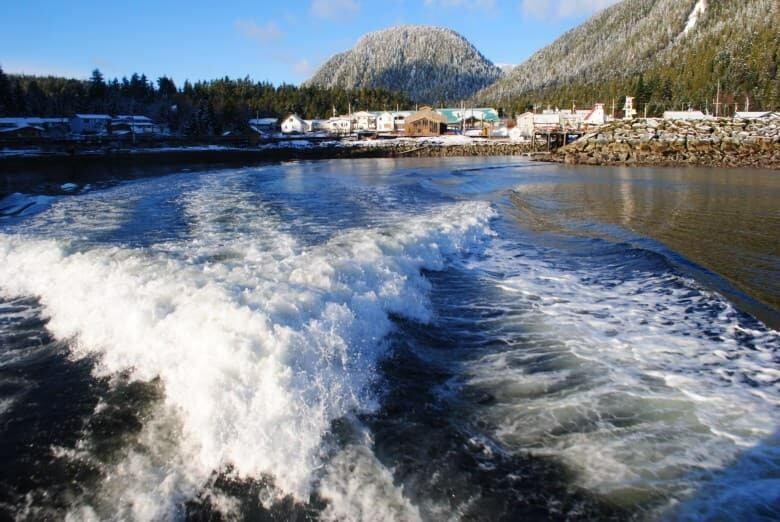 Back on the waters of the Douglas Channel, Amos's son Trevor pulls up in a small fishing boat, a freshly shot seal on the seat next to him. The two little girls, who are four and five, clamber to the edge of the boat to stare at the dead animal, its chest sliced open and the cavity emptied. A large seal can feed eight families or provide many meals for one family. The Haisla use every bit of the animal from the neck down: The thick fat and rich meat are eaten, while the pelt is treated to make drum skins. villagers have granted a major energy company permission to build a liquefied natural gas plant on their land. their language and traditions would also slip away. "When you're going out to collect the seafood, that's when you're exercising your culture," said Haisla chief Ellis Ross. "You're teaching the next generation — this is where you go to fish, this is how you fish, this is why you fish — that's our connection. It's more than just a food product." Could a First Nations-led pipeline proposal be a viable alternative to Northern Gateway?